No matter how you eat them, blueberries contain a wealth of nutrients and antioxidants that protect your health and may even improve your memory. If fresh blueberries are difficult to find, use frozen ones -- they are just as nutritious. Dried blueberries, on the other hand, offer some of the same vitamins and minerals, but have different nutritional information. One cup of fresh blueberries has 84 calories, while just 1/3 cup of dried blueberries has 130 calories, which is just one reason why fresh blueberries are healthier than dried ones. One of the most valuable aspects of blueberries is their high fiber content. Increasing your intake of fiber may help lower your cholesterol and help improve the health of your digestive system. Fresh blueberries contain more fiber per serving than dried blueberries. A 1-cup serving of fresh blueberries contains 3.6 g of fiber; a 1/3-cup serving of dried blueberries contains 2 g.
Fresh blueberries contain naturally occurring sugars that help your body produce energy. Blueberries fit perfectly into your healthy diet. 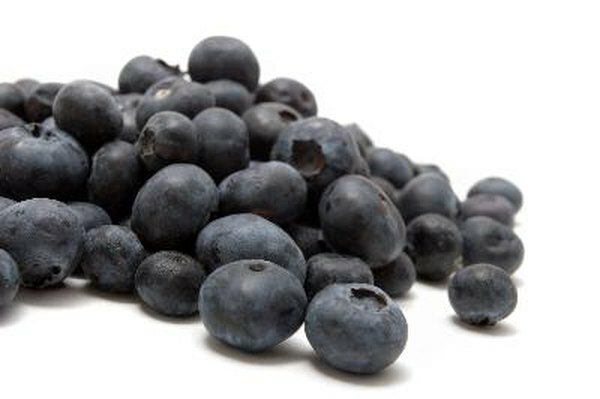 One cup of fresh blueberries contains 14.74 g of natural sugars. There are two types of dried blueberries -- ones with added sugar and low-sugar varieties. Regular dried blueberries may contain as much as 28 g of added sugar. A diet high in added sugar will cause you to consume too many calories, which can translate to unhealthy weight gain. Read nutrition labels to determine which brands of dried blueberries have the lowest sugar content. One cup of fresh blueberries supplies you with 14.4 mg of vitamin C, 28.6 micrograms of vitamin K and 9 micrograms of folate. They also offer 47 micrograms of beta-carotene, which is converted to vitamin A in your body. Dried blueberries supply some of these same nutrients, but in much smaller amounts. According to the Health Services at Columbia University, the preparation process of dried blueberries can significantly reduce their vitamin content, which makes them less nutrient-dense than their fresh counterparts. Similar to vitamins, the drying process causes blueberries to lose some of their mineral content. One cup of fresh blueberries supplies you with 114 mg of potassium, 9 mg of calcium, 9 mg of magnesium and about .4 mg of iron, while dried blueberries have significantly less of each of these.